Blaque: Well, once again I am back with another question and answer session. Today my spotlight author is Courtney Monya, who some of you, her readers, may know as Authoress Courtney Monya. She writes under the genre of Urban Fiction. Courtney: It is nice to meet you Blaque Diamond. Blaque: It is nice to meet you as well. So, before we get started, I would like to know, where are you from? No, this is not one of the questions from your interview, but I am always curious to know where people are from. LOL. Courtney: LOL. No problem. I am from Louisiana. Blaque: Oh, ok. Hmm… Nice. That is a state I would love to visit one day. I would like to experience the festivities of a Madi Gras celebration in New Orleans. Courtney: Yes, they are quite entertaining. There is so much to see and do during such an occasion. Blaque: I’m sure of that. So, let’s jump right on in. Courtney: Becoming an avid reader first inspired me to want to write. Life alone itself, inspires me to write as well. There’s so many things that I see on a day to day basis that will cause a scene or even a story plot to pop up in my head. Courtney: My biggest pet peeve(s) is for someone to lie to me. Especially when I feel I am one of the most understanding people you could ever meet. There’s no need to lie to me. Another is having to repeat myself. LOL. Courtney: Right now, my favorite place to write is my papa’s office. It allows me the quietness that I need to listen to music, zone out, and get things done. Courtney: One thing I would change about the world is how negative things get more recognition than positive, uplifting, and/or motivational things do. Blaque: What is your favorite food? Courtney: Almost any bread. LOL. Rolls, biscuits, pizza crust, etc. Anything with cheese and/or bread is aye okay with me. Courtney: I see myself as a more-established Author and Licensed Massage Therapist who’s supporting herself and giving back to those who supported her to the point where she is now. Courtney: As of today, I have three books published. Courtney: Some of anything. LOL. I am a big cry baby. I’ll laugh so hard that I cry, & I’ll even cry so hard that I’ll laugh. Courtney: It would be donated to Project Semicolon, because it is true that you NEVER know what someone is dealing with in their lives. Even if their lives SEEM perfect, you never know what they’re mentally battling within themselves. After all, we are our biggest critiques in life. Courtney: I could easily say that it’s my personality, but I think it’s more efficient for someone to determine that themselves. I’m always open to meeting new people, and I’m always going to be the same person no matter who you are. Courtney: I turn on my Gospel Pandora station and then go back and re-read my work. The mixture of the motivation from the music gets my mind back flowing. Courtney: My middle book, which is part 2 in my series, would have to be my favorite because the two newest main characters easily became my favorite characters. Earning their own possible spinoff? Maybe. Stay tuned to find out. Courtney: My favorite colors are blue, pink, purple, green, and any other pretty, bright colors. LOL. Courtney: I prefer writing on the computer. I hateeee writing, literally. LOL. Courtney: They just pop up in my mind as mini movies or clips, and I just write them down as soon as I think them. Courtney: What are you waiting on??? Do it! If your heart desires to write, then dammit (can I say that? LOL. ), write. & don’t just write what you think people want to read. Write what’s on your heart, and the RIGHT people will read it & LOVE your work. Courtney: My biggest accomplishment as an author would have to be . . . As of October 23rd, 2017, I FINALLY finished my first three-part book series after starting part one a year or more ago and shelving it shortly after. Courtney: If I would’ve answered this a little earlier, I would have to say my biggest fear was me and my thoughts. Well, not anymore after gaining my faith back to conquer that fear. NOW, spiders have been promoted to that spot and will probably forever be there, because I will not face that fear. Courtney: I love, love, loveeeee it! Because a lot of the time when I’m writing, a part of me is like, “Yo, this is fiireeeee.” Then another part of me is like, “Does this even make sense?” So, hearing from the reader that they loved it, makes me feel really good about it. Blaque: What an interesting interview. I’m sure your readers will enjoy getting to know the person behind the creative stories. Before we close out this segment, leave readers with your contact info so they can follow/be-friend you on social media to keep up with the latest and greatest from you. Courtney: Yes, definitely. I enjoy hearing from my readers. You can follow me on Twitter and Instagram. Readers can also send me a friend request on Facebook. Ok. Great! 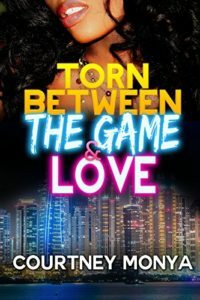 So, where can readers purchase the first book in the series, Torn Between the Game and Love? Courtney: All three of the books in my series can be purchased on Amazon. They are available as an EBook and paperback. Here is the link to the first book in the series. It won’t be hard for readers to spot the next book in the series so they can keep up with the action. Torn Between the Game and Love Book One. Blaque: Well, that just about does it for me today. It was a pleasure speaking with you Ms. Authoress Courtney Monya. Courtney: Thanks for the opportunity to interview with you Blaque Diamond. You don’t know how much this means to me and others out there looking for exposure. Blaque: It is nothing at all for me to do my part as an indie author to help other indie authors. I believe in the motto, “Lend a hand. Don’t break one.” Until next time. Happy writing.